It’s an expression so familiar to many of us – wide-eyed, helpless, numb. Toby Brown’s captivating portraits have been striking a chord since his exhibition opened in London: ‘For me the eyes tell the story, not necessarily the rest of the face. A person can still be smiling, but their eyes can say the opposite. The story and the battle scars are all there if you look close enough,’ he said. Brown spoke to The Psychologist about the harrowing experiences that eventually inspired him to turn to art, which had always been a hobby, in the face of depression. In 2008 while working as a motorbike courier Brown was weighed down with a mortgage and other debt, and faced with a family-run business on the brink of collapse. He took anti-depressants and visited a psychiatrist but struggled to open up, and self-medicated with illegal drugs. Brown was eventually admitted to hospital after which his marriage dissolved and he ended up starting over, moving into an old caravan on an industrial unit. Since that time in 2009 he has worked tirelessly to lead a ‘normal’ life again. 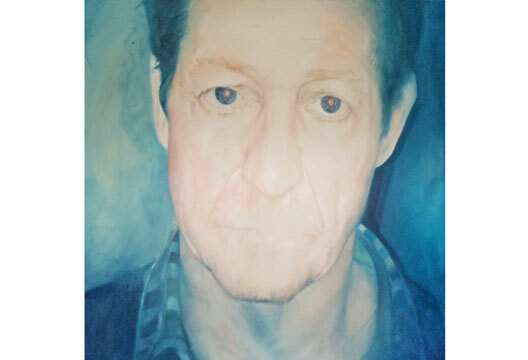 Around four years ago, after suffering and battling against his mental health problems, Brown took up a brush and painted three self-portraits in an effort to convey the ‘pain and torture’ of depression, so often thought of as an invisible illness. ‘We try and carry on with our daily lives, even though this is how we really feel, we can't just pull ourselves out of it. It takes time and a lot of fighting with ourselves. Depression gets inside your bones,’ he said.